This news is just shocking. The last active PGA or LPGA player* I can recall dying is Payne Stewart in 1999. 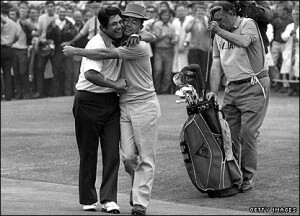 Tony Lema died in 1966 less than 24 hours after competing in the PGA Championship but there is probably a more recent example. Heather Farr died of cancer at age 28 in 1993, but she hadnâ€™t played the LPGA in 4 years before her death. Blasberg had just finished T44 in Mexico last week. Her best ever LPGA finish was a tie for 8th in 2008.RIP. The body of Erica Blasberg, an LPGA player, was found Sunday afternoon at her home in Henderson according to a police spokesman. The six-year tour player was 25 years old.< No cause of death was disclosed, according to a spokeswoman for the Clark County Coroner's Office, because of the pending investigation. In her only start this season, Blasberg tied for 44th two weeks ago at the Tres Marias Championship in Morelia, Mexico, after having Monday qualified. *- I deliberately omitted the Seniors or Champions Tour. Those players are older and a sudden death is more likely. Bert Yancey went into cardiac arrest in the scorerâ€™s tent and died soon after. He was 56 at the time. Senior Tour player Jack Kiefer died in 1999 of spinal cancer a year after his last tour event. Ai Miyazato of Japan won her third tournament of the LPGA season, shooting a 6-under 67 on Sunday to win the Tres Marias Championship. The Japanese totaled 19-under 273 to finish a shot ahead of Stacy Lewis (66) of United States and two in front of Michelle Wie (68). Miyazato shared the spotlight with No. 1-ranked Lorena Ochoa, who played the final round of her career before stepping into retirement to raise a family and focus on her charity foundation. Ochoa shot 71 to finish on 280. She has won this event three of the past four years. Ochoa has held the No. 1 ranking since April 2007 but she will lose it when the rankings come out Monday, with Jiyai Shin of Taiwan taking over. Shin won a tour event in Japan on Sunday. Check out The Constructivist’s post on Shin’s victory. The tournament belonged to the Japanese from Okinawa, who won earlier this season in Thailand and Singapore. Miyazato deserved to win but I wouldn’t say the tournament belonged to her. She had to beat back serious challenges from Michelle Wie and Stacy Lewis on Sunday. Note- Miyazato has four LPGA wins but has yet to win in the United States. Her one win prior to this year was in France. In accepting the winning trophy on the 18th green, Miyazato broke down crying as she thanked Ochoa. Ochoa, a few feet away, also rubbed tears from her eyes in bright sunlight on the mountainside course. Ochoa choose Miyazato as her playing partner for the first two rounds. As she spoke, thousands surrounding the greenâ€”standing high a hillsideâ€” broke into applause. Michelle Ellis, president of the LPGA players association, stood in a long line of players who saluted Ochoa on the 18th green. â€œShe is going to be dearly missed by the players and all member of the LPGA family,â€ Ellis said, with Mexican mariachis playing as Ochoa left the green. Ochoa won 27 tournamentsâ€”including two majors, has held the No. 1 ranking for three years and won the Player of the Year title four straight years. Ochoa did not play the ten years required for automatic qualifying for the Hall of Fame. She will be voted in, and I’m betting it will take place the first year she is eligible. Much has been written about the LPGA losing its star(Ochoa) but right now the tour has a tug of war for #1 in the world. Shin will be ranked 1st by Rolex tomorrow but Miyazato will be close behind her and Norway’s Suzann Pettersen and Taiwan’s Yani Tseng a close 3rd and 4th*. If Miyazato wins the Salonpas Cup, the first JLPGA major of 2010, she will take #1 from Shin. Four or more players battling for the top spot in women[s professional golf. Why do golf writers insist on saying the LPGA is hurt by its lack of a dominant player when so many are contending for #1? Maybe they hate not being able to articles and columns that take adulation to extremes fear change and the unknown. I think Brent Kelley gets it right. So we say goodbye to Lorena Ochoa today, we wish her well, we thank her for great golf, her humanity, her humility. And we say hello to the future of golf. I think there is plenty of excitement ahead for Women’s professional golf. Also blogging on Miyazato’s win- Hound Dog, Sal Johnson, Stephanie Wei, and The Constructivist. *- That is if Ochoa is taken down since she is retired. She may linger in the top 5 for a while otherwise. This news is just stunning. Lorena Ochoa, the worldâ€™s top-ranked womenâ€™s golfer, announced her retirement Tuesday. Ochoa, 28, confirmed the news in a statement released by her management company, Ochoa Group. A news conference is scheduled for Friday in Mexico City. She has 27 career titles, including two majors (2007 Womenâ€™s British Open, 2008 Kraft Nabisco Championship) and has $14.2 million in career earnings. Ochoa married Andres Conesa, the director general of Aeromexico airline, one of her sponsors, last year. A Mexican newspaper, citing an unidentified source, says Ochoa could come back later. That isnâ€™t consistent with the word â€˜retirementâ€™ used in her statement. I guess we have to wait till Fridayâ€™s press conference to know what Lorena means. Ochoaâ€™s retirement is a stunner because of its timing. 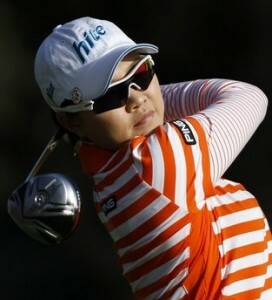 She needs to play the LPGA till 2012 to be eligible for the Hall of Fame. Her points total already qualifies her, but a player must play the tour for 10 years also and Ochoa was a rookie in 2003. Ochoa has always come off as a class act. Former #1 Annika Sorenstam frequently came off as arrogant to me, and Ochoa never did. I did have the pleasure of blogging Ochoaâ€™s win at the 2007 ADT Championship and was in press conferences with her. While Ochoa won player of the year in 2009, it was by only one point. Her play was not anywhere near the level it was in 2007 and early 2008. 1st to 5th place is only separated by 1.12 points. In a few weeks an Asian born golfer is going to rise to #1 player in the world. The Super Model of the Fairways(her KLPGA nickname) made it look easy today. 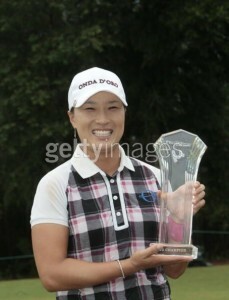 She shot a 2-under 70 to win by6 shots over 2008 U.S Open Champion Inbee Park. Other than a tee shot in the water Seo was nearly flawless on the day. She entered the round with a 5 shot lead and saw it shrink to four shots early on. Back to back birdies on three and four pretty much stifled the idea of a final round collapse. Seo was the 40th ranked player in the world but will move up after this win. She did not have LPGA playing priviliges before her victory. She was playing in the tournament on a sponsor’s exemption. Now Seo faces a decision, to play the LPGA full-time in 2010 or not. It may depend on her Korean commitments. Seo has expressed her desire to play the LPGA. For those of you unfamilar with Seo, she won 11 KLPGA tournaments in 2008 and 2009. In 2009 she won 3 KLPGA majors. This player could have a big impact on the LPGA. In fact she may be one of the ten favorites at next weekend’s Kraft Nabisco Championship, the LPGA’s first major of 2010. Other assorted notes about the tournament. *- From the I’ve never seen that before department. Seo’s tee shot on 14 hit some wires overhanging the fairway. She got to replay her shot. That’s the rules and I’ve never seen anything like this happen in 32 years of television golf watching. *- Seo is very attractive. She could change the view of the Asian players on tour but she’ll have to drop those dark shades she wears when playing. It hides her beauty. Photos in this post are courtesy of AP Photo/Denis Poroy and the website Seoulsisters. 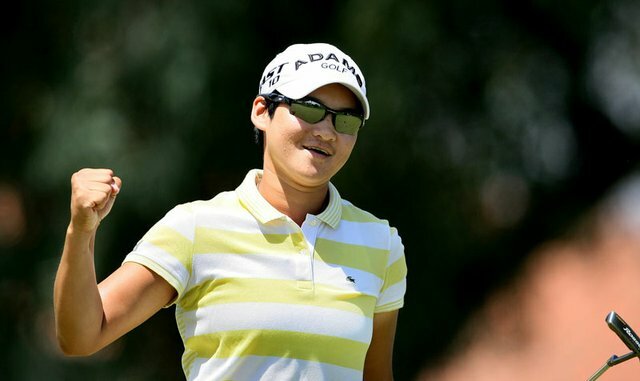 *- Asian golfers have won all 3 LPGA events this year. In fact the Kia leaderboard was dominated by Asian golfers, eight of the top 10 finishers were either born in Asia or Asian-American. (Four of the top 5 were South Korean. Seo, Park, Jee Young Lee, and Jiyai Shin. The other was Candie Kung, a naturalized United States citizen born in Taiwan.) Of the top 20 finishers, only 6 golfers didn’t have at least one Asian parent(Stacy Prammanasudh’s Dad is Thai, Pat Hurst’s mother is Japanese). If another wins the Kraft Nabisco(Only Asian golfer to win it ever is Grace Park in 2004), we may hear again ugly and hateful talk again similar to what was written in this column, which I then took apart in this post. *- Michelle Wie’s play on today’s 11th hole is going to be the subject of lots of talk the next few days. The hole is a par-5 and Michelle’s 2nd shot came up short in the water. Wie tried to play it, but barely budged her shot. After completing her swing, Michelle inadvertently grounded her club. She was assessed a 2-stroke penalty, which dropped her out of a tie for 2nd to a tie for 6th. Wie told a rules official that she only grounded the club because she worried she was going to lose her balance. She did have a unsteady stance because of having to hit from the water. I agree with the officials, Wie put the club down and didn’t need to do so to steady herself. When she was told of the penalty, Michelle called it unfair. *- Inbee Park looks to be playing well again. She struggled after winning the U.S. Open two years ago, but has started 2010 strongly. 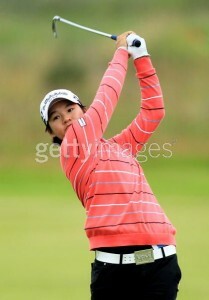 in addition to this week, she finished 2nd or 3rd in a JLPGA event. *- The #1 play in the world, Lorena Ochoa, continues to play poorly. She finished T-52. *- Golf Channel cut away from the customary bathing of the winner in beer after walking off 18 to show Wie talking with rules officials. A dumb and unnecessary move by GC. Update- Hound Dog is also blogging on the final round. 2nd Update- Also blogging on Seo’s victory or the Wie ruling- The Constructivist, Geoff Shackelford, and Jeff Skinner. The rumored tournament is now official. 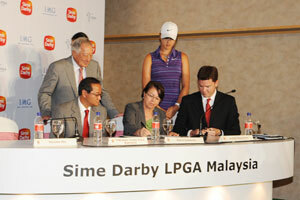 Today the LPGA announced that the inaugural Sime Darby LPGA Malaysia will be played October 22-24, 2010 at the prestigious Kuala Lumpur Golf and Country Club (KLGCC). The announcement was made in Malaysia by Zayra Calderon, LPGA Executive Vice President, Tournament Development & Worldwide Sales, along with officials from Sime Darby Group and IMG, the tournament organizer. The new LPGA tournament, to be held at least through 2012 per the three-year agreement, will feature the top 50 LPGA members from the Official Money List, along with 10 sponsor’s exemptions. The 54-hole stroke play event with no cut will ensure that fans â€“ many of whom will be viewing an LPGA event live for the first time â€“ can catch all of their favorite stars in action throughout the weekend. The tournament will be shown on Golf Channel. Another week on 2010 calendar is filled. Coud the LPGA be back to playing 30 plus tournaments a year in 2011? At present the signs are hopeful.